Use it up! I'm finding inspiration using old embellishments that I haven't touched in months. My mantra this week is USE IT UP! There are so many new products that will be coming onto the market soon....while we're waiting for new goodies, why not use up some of the stuff in your embellishment stash!? I pulled out these little sparkly Hero Arts flower sequins that I bought a year ago, and am trying to use up a ton of them. The dog images are by Penny Black, from Joy and Daisy at Eclectic Paperie. I love playing with stamped off images...I get to use stuff that I normally wouldn't venture into or think to use! The paper is new Basic Grey "Infuse Season". I watercolored the dogs using Stamping Up markers and an aquapainter. How cute is this Elsie "Betty Flowery" paper? It's so bright and cheery, I thought it was perfect with these little chicks from Penny Black. I have to admit, the 2 cards I made with it did not come easily tonite. I putzed around so long with them I started getting frustrated and wanted to chuck them in the circular file.I think it was the pressure of trying to come up with a card when my mojo is at ground zero, and I've done nothing but lay on a lawnchair on the beach all weekend! The large flower is from the sizzix "Large Daisy" die cut, covered in a pink polka dot paper from Eclectic Paperie. The cute little chick images were given to me by Joy and Daisy from Eclectic Paperie also. I got the idea to punch holes in the scalloped edges from a scrapbook magazine. I think it makes your scallops look cute and lacy! The corners were done with a cuttlebug embossing folder and then sprayed with the Tattered Angels Glimmer Mist (Terra Cotta) that I got from Wen dy at CHA. My mojo is pretty shot this week, so one last post before I'm off for the cabin this weekend. I actually thought today was WEDNESDAY when I got into work! I missed a day somewhere! Oh well, one day closer to Friday! Check out the stinkin cute little Penny Black "Cheers" cow image that Joy and Daisy from Eclectic Paperie stamped off for us for CHA last weekend! I love her little bikini & the foo-foo drink in her hand! I tried to make her look a little sunburned by watercoloring her tummy with blush blossom ink, and then went a little pinker on top with rose romance ink. 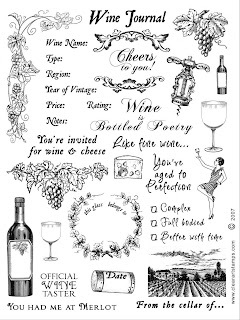 The "Cheers to You" sentiment is from the Crafty Secrets/ClearArtStamps "Wine Lovers" set. This green polka dot ribbon from Starlit Studio's Ebay store is my favorite. (I bought a whole spool of it, so now I can use it guilt-free.) The flowers have been glittered up with Stickles "Waterfall" colored glitter glue. The centers are some shimmery hero arts sequins that fit perfectly inside the centers. Hope everyone has a relaxing weekend! Stay cool! Ok, you'll have to bear with me on the pics... Vicki Chrisman has much better photos, so you'll have to check out her blog for a better view. Keep in mind, photography is not one of my talents. This is a shot of the Crafty Secrets booth where I was demoing the new release ClearArt Stamp sets at CHA this weekend. There's Sandy in the background talking to a customer. I knew I liked her when she ended up wearing her flip flops with that cute cute little skirt! I ended up wearing mine for most of the show too, for sheer comfort. Both of us noted that our feet weren't sore at all! It's either the flip-flops or the faux hardwood floor we were on. It looked like hardwood floors, but then you stepped onto it and realized it was CUSHY! I kept telling visitors they could come back and hang out if they wanted, to give their feet a break! See the gaggle of women at the Ranger booth behind us? I had to be TOLD that Tim Holtz & Robin were demoing stuff right behind us. DOH. NOT SO CLEAR ON MY SURROUNDINGS. I was pretty much in a stupor the whole time I was there! Here's Wendy, Sandy's sister. She's the math whiz of the group. She came equipped with GINORMOUS calculators. She kept Sandy and I in line, and took care of orders & setup. She worked SO hard the entire show! Sandy had all of these cute little fence displays for us to hang all the samples on. Check out the Vicki Chrisman eye candy in the middle. I freak when I see the stuff on her blog, but in person, OH MAN, get the paddles out. Serious heart failure here. Here's the Halloween fence. That harlequin paper is my FAVORITE and is SO SO SO vintage Halloween! This cute little dress form was SO adorable with samples hanging from it. More Joy & Daisy goodies. Alrighty then. I'm heading to bed so I can be up at the crack of dawn for my flight to Chicago tomorrow! Samples packed? Check. Underwear? Check. Makeup? OH YEAH, CAN'T LIVE WITHOUT THAT. Although chalk ink might do in a pinch if I can scrounge some up at the show. One last wine sample (you are sighing with relief, right?) I went bolder with the colors on these, forest green and a deep plum. I can't wait to get home and have more time to play with these grape images. I put samples together quickly and didn't have time to putz with a lot of the coloring. The corkscrews were embossed onto the plum paper with white embossing powder and white pigment ink. I used watercolor paper for the main images, and an aquapainter with SU reinkers. The wine bottle was stamped on that famous "corkish" paper I've been using. Hope you guys have a fabulous weekend & I hope to see some of you in Chicago at the show! Thank you, Bevie & Beth for your great suggestions for the wine journal! Recording your wine tasting weekend adventures & your favorite wines/occasions are AWESOME ideas. I was even thinking it would be a great travel journal, because you can add photos in between your notes. I wish I would have known about wine journals a long time ago, I would have taken photos with friends drinking wine on the various trips we've taken to France & Italy (wine central!). My sister and I went to Rome with 2 other friends a few years ago. The day we arrived, we ended up in this little restaurant that had their own brand of house red wine. We were jetlagged, tired, and grateful to be on the ground instead of an airplane, so one bottle of wine turned into another, and before we realized what we had done, we drank 2 bottles of wine between the 2 of us. Lets just say it was not pretty. We decided it was time to leave when I took a drink of wine and spilled it down the front of my shirt. That would have been a PERFECT photo for my wine journal! Thankfully, I had taken off the WHITE PASHMINA scarf that I had just purchased from one of the street vendors, so it was spared from the bright purple disaster. For some reason, neither of us had hangovers the next day! I'm told that it has something to do with the lack of preservatives? Anyone know? The worst part was, we ended up back there a week later, and I was sporting a cast and a sprained pinky finger. Anyway, I'm off on a tangent here. The photos are of a gift ensemble I created around the wine journal (see yesterday's post). All in all, it would be a pretty cheap gift. The Crafty Secrets Wood File Folder Album sells for $6.95, the wine charms are the cost of 2 pieces of cardstock, and depending on what type of wine you choose, you can have a pretty cute gift for under $20.00. The paper for the wine charms is by Stampin Up, it's their new Pomegranite colored paper. Here I also used the Hero Arts Distress background to give it an aged look. **First off, I have to call attention to a GASP worthy creation by Michelle Kovack. She has the fairy stamps from Crafty Secrets, and GEEZ ALMIGHTY, she's rockin' them. You can see her card HERE. I had too much wine last night. I have a large headache today. Excuse me while I go nap a while. Anyway, my version of them has the file tabbies so you can have separate sections. I took a photo of the album before I put it together, so you could see all the sections in one shot (see top photo). All of the paper is from the Crafty Secrets "Earthy" paper pad, and the scallop circle was done with Stampin Up's new Pomegranite paper. To color in the grapes and vines, I used prismacolor pencils, but they would be just as great watercolored or markered in. I like the prismacolors because you can get color to pop on darker paper. I chose the darker brown paper because it looked sort of 'corkish' to me. The rectangular distressed background on each of the file tabs is by Hero Arts, H3307 "Aged Background Block". The dark brown ink is Tim Holtz "Vintage Photo" Distress ink, and the lighter brown ink for the background is his "Antique Linen" color. Here's more cards from the "Feathered Friends" retired stamp set from Stampin Up. I had done a bunch of cards using this set a while back when I felt like coloring one night. This paper by Daisy D's is one of my faves of the Boston Garden line. I think it's pretty versatile; you can use it for fall cards or summer cards, depending on what you pair it up with. Here I used Stampin Up Artichoke paper to pull out the greens in the paper. I'll be heading out to Chicago next week to work in the Crafty Secrets booth for CHA, so tomorrow I'll have a sneak preview of a new stamp set that Crafty is introducing! Sandy has been working so hard to get all the fun new stamp sets finished, and I CANNOT wait to get my grubby little inky fingers on them! 2. My cat hates my voice. When I talk on the phone he freaks out and attacks me. Now that I think of it, my family hates my voice too. My sister calls me a chihuahua on speed. 4. I have a tattoo, and own a pair of chaps, but dont' ride a motorcycle. The tattoo was for my 40th birthday. I figured what the hell, I'm 40, who do I have left to impress at this point? I did sell my "BORN to RIDE" stamp set last year though. I may be almost over my midlife crisis. 6. My fave group is the Black Eyed Peas & Fergie. Gwen Stefani comes in 2nd. 7. Weight watchers makes a key lime pie dessert that's only 4 points. Wait, that's not a random fact. I just thought you guys would want to know that in general. It's KEY LIME PIE! YUM!